CDS resources like UpToDate provide complete treatment, screening, and diagnostic recommendations; medication dosing information; medical calculators that save time and reduce mathematical error; practice-changing evidence notification, and much more. By integrating these resources within the clinical workflow, clinicians and institutions reduce errors, avoid unnecessary tests, accelerate treatment planning, and improve outcomes. 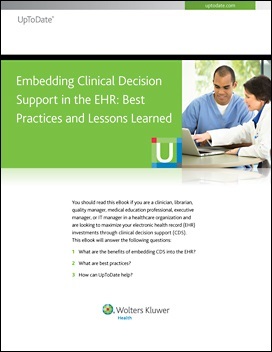 What are the benefits of embedding CDS into the EHR?